On June 1st, 1982, Randy "Wayne Fondle" Mentzer and Jim "Stinky" Gaites were trapped spectators at a high school graduation. They sat far in the back, atop a balcony, distant onlookers on the dull ceremony, when they came upon the idea of forming the most politically incorrect rock band in the world. 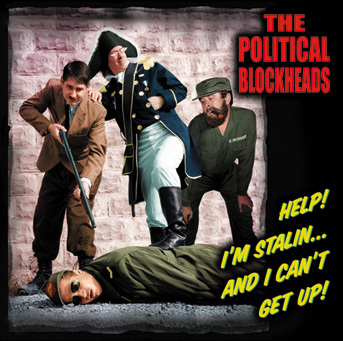 It was decided the group would be called, "The Political Blockheads." 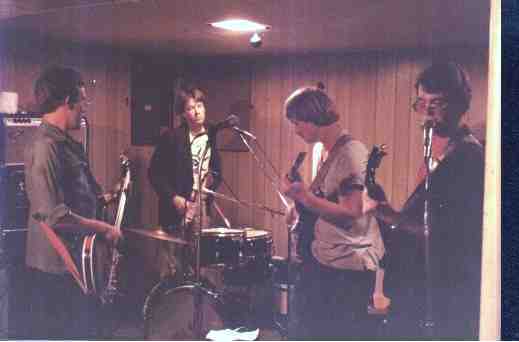 Wayne played guitar, and Jim the drums. They elected a bass player, Doug "Mr. Scientits" Knox, who could also write lyrics. Buddy "Sudsy" Mentzer, Randy's brother, joined the band playing the saxophone. 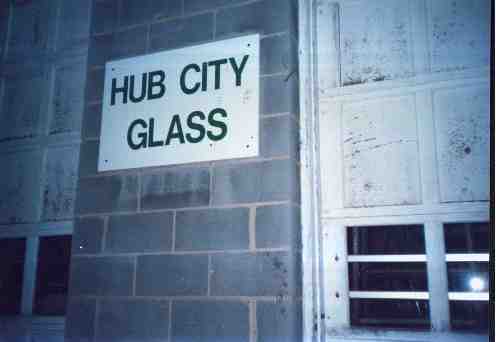 They practiced, and slowly formed their unique sound at the infamous capitalist enterprise, "Hub City Glass Company." In 1983 they began to make public appearances. The concerts were called "rallies"; the songs called "speeches." They had a great deal of success playing at private parties, and in 1984, they became regular performers at the "D.C. Space" Nightclub in Washington DC. 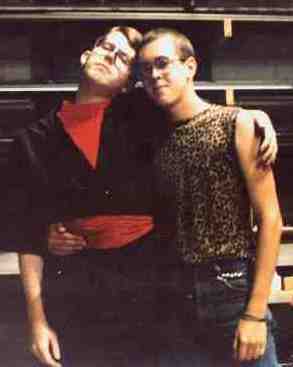 In late 1984, founding Bass Player Doug Knox (left) was secretly replaced by a look-alike, Bruce Reed (right.) It was hoped that no one would notice, but the Blockheads began recording backwards messages on their albums. "Doug is dead," and the now famous, "Turn me on, Doug man." can still be heard today if one knows where to listen. 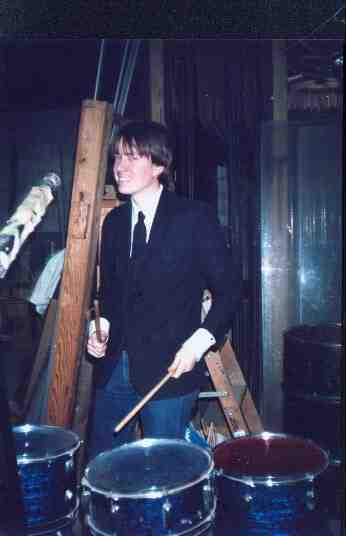 ln 1987, Bruce Reed left the band to move to Anaheim, CA, in order to be closer to Mickey Mouse. After several ill-fated attempts at recruiting a bass player, an ad-hoc sub-committee was formed to find an acceptable replacement, and, after round-the-clock negotiations, Doug "DT" Smith was nominated and finally appointed as the new bass player. Once again, the Blockheads had a Doug on bass. Doug is a talented guitar and banjo player as well. With the addition of D.T. Smith, the Blockheads set out to expand their repertoire. New speeches such as "Mr. Brown," "Greenpeace Radical, "Exxon Valdez," "Silverado," and "Oklahoma City" were born, and many of the older speeches took on new life. Over the years, the Political Blockheads have had several Sax players. 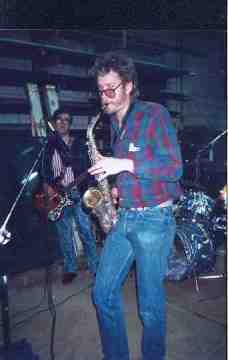 Early in 1984, founding saxophone player, Buddy "Sudsy" Mentzer (left) left the band, as it was not adhering to Maoist doctrine. 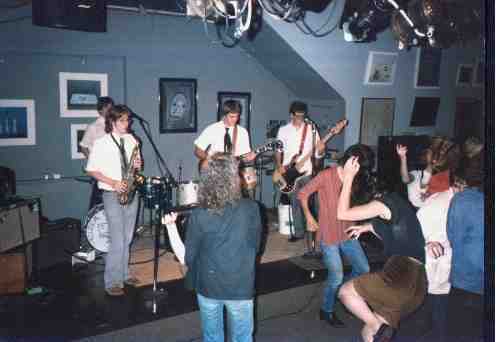 He was replaced by an intermediary sax man, Brent Progecene (middle), a politically moderate musician who eventually departed in 1986. 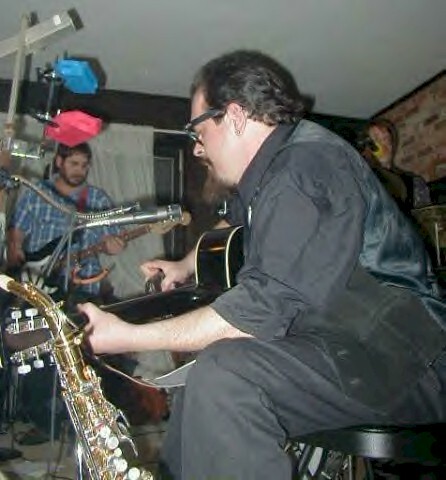 Former bass player Bruce returned (after his 7 year exile behind the Iron Disney Curtain), and became the saxophone player, beer retriever, and designated driver. 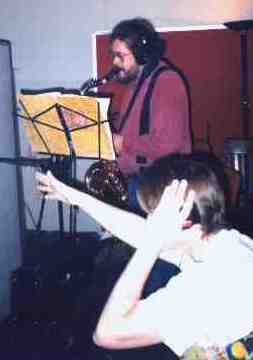 Bruce is shown (right) taking direction from Jim Gaites during a fevered recording session for "Help! I'm Stalin and I Can't Get Up!" 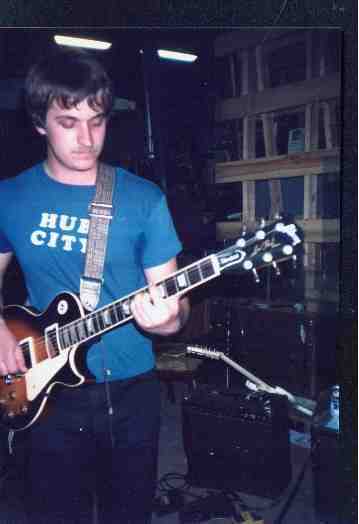 In 1991, Jeff Campbell became the manager of the band. From the very start, the mix of an anarchist, beer-drinking, garage band and a self-promoting, capitalistic entrepreneur was a rocky relationship. Within just a few months, Bruce quit the band and they were again without a sax player! With the creation in 1994 of a 3-track demo tape entitled "Demonstrate!" produced at Inner Ear Studios, Jeff contacted clubs to promote the band and get paying gigs. His only success was in 1995 at the 'Grog and Tankard' in Georgetown. Jeff's short career as the band's manager took it's toll: Not only had the sax player left, but Jeff's wife kicked him out of the house and the apartment building Jeff then moved into caught on fire. Jeff's car was repossessed by a collection agency and he soon declared bankruptcy. 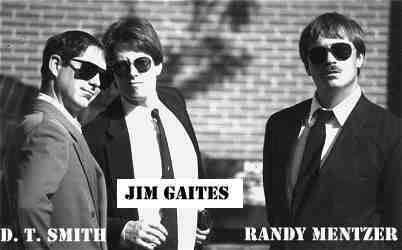 In 1998, Drummer Jim Gaites enlisted the help of recording engineer Bentley Westfield and began the process that has resulted in production of two CDs. The first, entitled "Help! 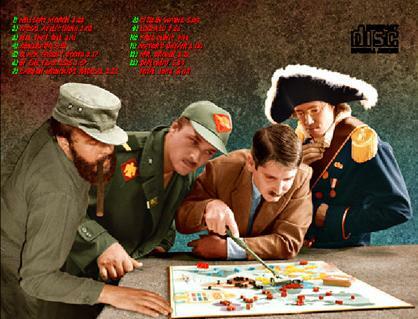 I'm Stalin... and I Can't Get Up! ", was released in October, 2000 and has some of their best material, such as Kill That Bill, Silverado, Black Fascist Boots and South China Sea Spleen. 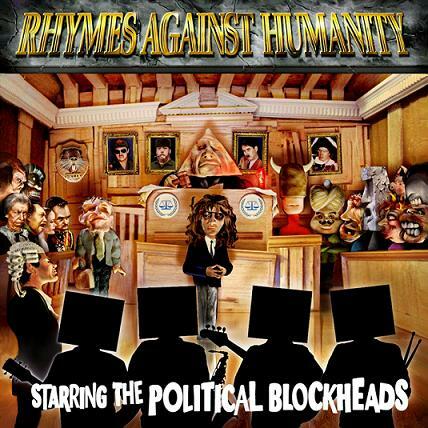 The second volume has tracks split between music and a courtroom drama in which the band's 1st CD is used as evidence against them for their "Rhymes Against Humanity". Classic Blockheads speeches here include Princess Grace, Refugee, Political Whale and Exxon Valdez. You may ask, "What is next for the Political Blockheads? People often do... including the band members.